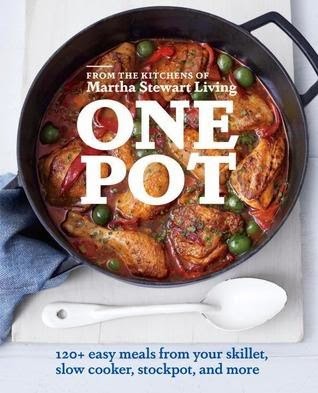 The editors of Martha Stewart Living take 30-minute meals and everyday food to the next level with one-pot meals; more than 120 innovative, comfort-food recipes make use of just a pot, a sheet pan, a skillet, a slow cooker, or a pressure cooker for meals that are delicious, satisfying, and quick to clean up, too. MSLO's latest cookbook features something everyone wants more of: all-in-one meals. Packed with 120 gorgeous images and recipes for one-pot wonders (including their food hack for One-Pan Pasta that went viral over the summer), this cookbook helps you get in and out of the kitchen with only one vessel to clean. From chicken and vegetables that roast on the same sheet pan to skillet lasagna, baked risotto, soups, and down-home casseroles, this is the volume that gives you the biggest flavor payoff with the smallest efforts. Here, too, are a dozen recipes for one-bowl desserts that can be ready when you are. Ahh Martha Stewart..the woman who it seems can do it all. When offered this cookbook, I couldn't say no. I knew the recipes would be delicious and heck, I love cookbooks. It was a win-win and it turns out I was right. This is a beautiful cookbook. Each section starts with tips and tricks on how to pick the best pan for than section. Every single recipe has a photo to go with it and while some didn't make me drool, others sure did. I can't wait until the boys are here and we can choose a recipe to try out.